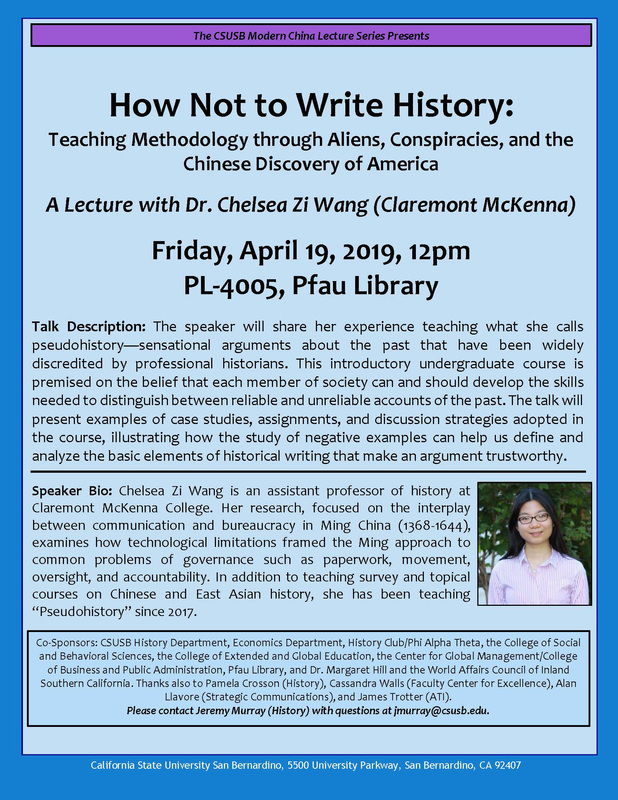 “How Not to Write History: Teaching Methodology Through Aliens, Conspiracies, and the Chinese Discovery of America,” will be presented by Chelsea Zi Wang, an assistant professor of history at Claremont McKenna College, on April 19. Pseudohistory – sensational arguments about the past that have been widely discredited by professional historians – and how to discern what is reliable when presented with multiple accounts will be the topic of the next Modern China Lecture set for April 19 at Cal State San Bernardino. “How Not to Write History: Teaching Methodology Through Aliens, Conspiracies, and the Chinese Discovery of America,” will be presented by Chelsea Zi Wang, an assistant professor of history at Claremont McKenna College, beginning at noon in room PL-4005 in the John M. Pfau Library. The presentation is free and open to the public; parking at the university is $6. Wang teaches a course on “pseudohistory” at Claremont McKenna that aims to equip students with “skills and principles that can be used to assess the strengths of historical arguments in particular and of arguments in general,” according to a course syllabus. Her presentation at CSUSB “will present examples of case studies, assignments, and discussion strategies adopted in the course, illustrating how the study of negative examples can help us define and analyze the basic elements of historical writing that make an argument trustworthy,” according to the talk’s description. Wang’s research, focused on the interplay between communication and bureaucracy in Ming China (1368-1644), examines how technological limitations framed the Ming approach to common problems of governance such as paperwork, movement, oversight and accountability. In addition to teaching survey and topical courses on Chinese and East Asian history, she has been teaching the course on pseudohistory since 2017. The next, and final, lecture in this academic year will be presented on May 23 by Ruixue Jia, an assistant professor of economics at UC San Diego, whose presentation will focus on political hierarchy and regional development in China from the years 1000-2000 AD. The series cosponsors are the CSUSB Department of History, the Department of Economics, the History Club/Phi Alpha Theta, the College of Social and Behavioral Sciences, the College of Extended and Global Education, the Center for Global Management/Jack H. Brown College of Business and Public Administration, John M. Pfau Library, and Margaret Hill and the World Affairs Council of Inland Southern California. For more information on the April 19 event or the Modern China Lecture Series, contact Jeremy Murray, associate professor of history, at jmurray@csusb.edu.